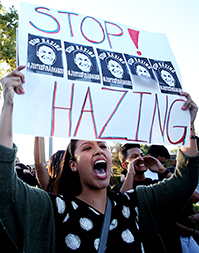 Should colleges ban fraternities and sororities? Fraternities and sororities, prominent on college campuses for nearly two centuries, are under intense scrutiny because of misdeeds — largely by fraternity members — ranging from binge drinking and racism to deadly hazing injuries and sexual assault. Since 2005, more than 60 people have died in fraternity-related incidents, according to Bloomberg News, and this fall 37 New York City fraternity members were charged in the death of a pledge, including five who face murder charges. Supporters of Greek organizations argue that only a small number of members commit serious violations. Moreover, they say fraternities and sororities — now at a record 750,000 members — provide invaluable leadership training, networking opportunities and emotional and academic support. Still, a national association representing 73 fraternities has commissioned task forces to address Greek hazing, sexual assault and alcohol use. And some critics want to go further. They are recommending that Greek organizations go coed, hoping that women would have a civilizing effect on behavior, or are pushing for an outright ban on fraternities and sororities — ideas that Greek groups strongly resist.